They've been swimming off the southern coast of Australia for untold millenia, and the first specimen was put in a museum almost a hundred years ago. But they only received a scientific name—Phyllopteryx dewysea—and a common name—“ruby seadragon”—one week ago. Josefin Stiller, a graduate student at the Scripps Institution of Oceanography at UC San Diego, described her surprising discovery with two other marine biologists in the journal Royal Society Open Science. They introduce seadragons as “fish of mesmerizing beauty,” and the new species is no exception. The two species previously known, the leafy seadragon and the weedy seadragon, are mostly yellow with motley splotches of color and many decorative appendages. This helps them blend in with seaweeds and seagrasses in the shallow water they call home. The ruby seadragon, by contrast, is a vivid red with no frills—suitable camouflage for its own home in deeper, darker water, where red animals appear almost colorless. Their preferred depth is probably the reason ruby seadragons escaped notice for so many years, while their leafy and weedy cousins have attracted scuba divers from around the world. The ruby specimen that caught Stiller’s attention was collected in a deep-water trawl as part of a biodiversity survey in 2007. Although its color was captured by a photograph on board the research vessel, it was labeled a weedy seadragon, preserved in alcohol and archived at the Western Australian Museum. Genetics eventually gave it away. While studying several samples of seadragon tissue from the museum, Stiller found one that was clearly not weedy or leafy. Further analysis proved that it was indeed a new species. She and her colleagues then combed through old museum collections and found several more ruby seadragons that had been misidentified as weedy, the earliest from 1919. 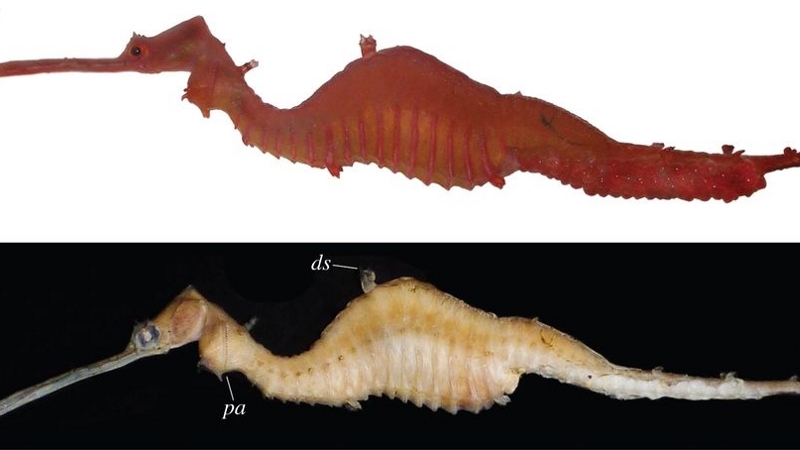 The ruby seadragon is the first new seadragon that has been discovered in 150 years. Curiously enough, the day after Stiller’s study was published, the first new ichthyosaur in 130 years was also named. Paleontologist Dean R. Lomax of the University of Manchester found his hidden treasure languishing in the collections of the Doncaster Museum. The fairly complete fossil of a marine reptile had been on display for several years in the 80’s, shortly after being dug up, but was then filed away. Lomax was the first to observe that certain bones made this specimen stand apart from every other species of ichthyosaur. With professor Judy Massare from the State University of New York, Lomax used careful measurements of femur and humerus to describe the new species, which they named Ichthyosaurus anningae in the Journal of Vertebrate Paleontology. 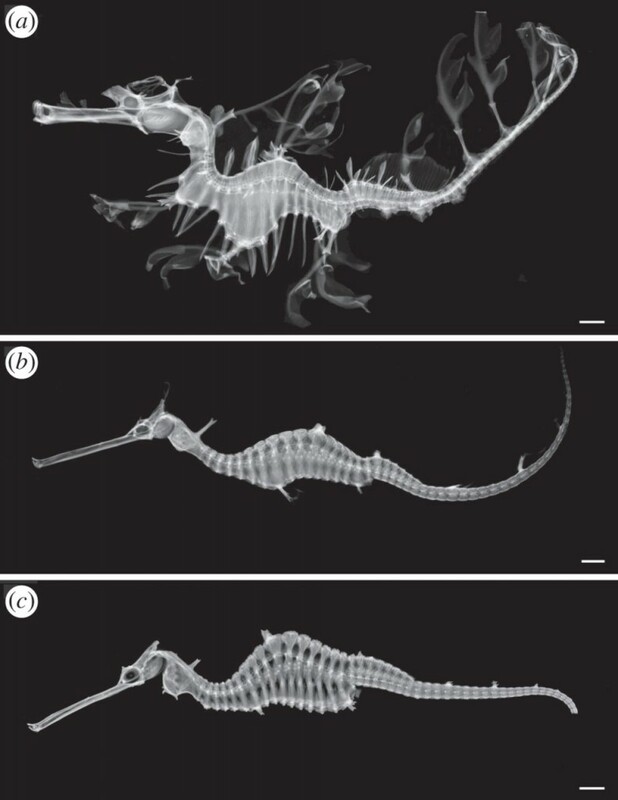 As in the case of the seadragon, after recognizing the species the scientists found other archived representatives that had been misidentified. The coincidence of these two discoveries may seem incredible, but in fact it simply illustrates how often new species emerge from museum collections. Without taxonomists, however, multiple species are often unknowingly lumped into one, as was the case for the weedy and ruby seadragons. This hampers conservation efforts. Leafy and weedy seadragons have suffered from over-collection as well as pollution to their shallow water habitats. Today both are listed by the International Union for Conservation of Nature as Near Threatened, and protected by Australian law. Meanwhile, ruby seadragons have yet to be documented in their natural habitat, and we know nothing about their conservation status. Learning that they exist was a necessary first step. 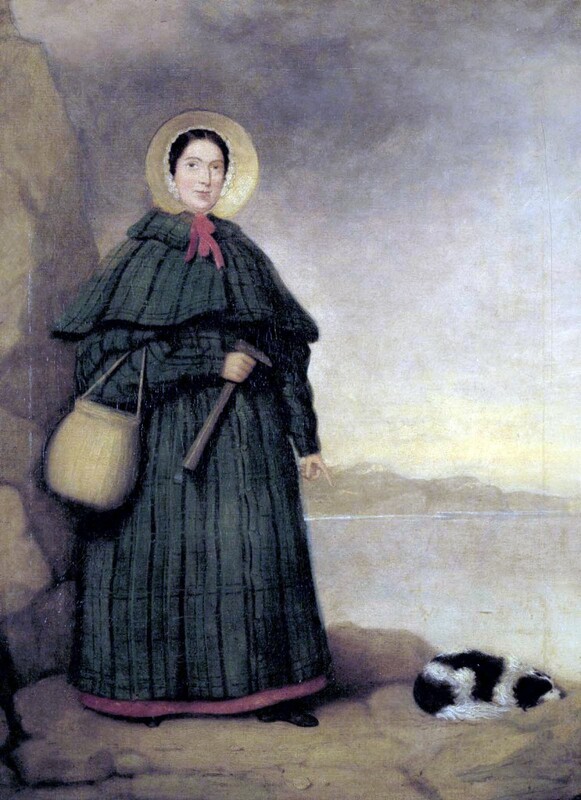 A painting of the influential paleontologist Mary Anning in front of a hill famous for its fossils. Ichthyosaurs, of course, have been extinct for 90 million years, so it’s a little late to be concerned about conservation. But the description of a new species expands our picture of the ancient seas and our understanding of evolution. Scientists are learning how these prehistoric swimming reptiles descended from ancestors who walked on land, just as modern whales and dolphins did.